Delve into the mind of a teen whose journey of self-discovery leads to the unthinkable in this tense and terse novel from award-wining author Chris Lynch.Alexander, who wants to be called Xan, is a misfit. He has never fit in�not in academics, sports, or social life. He�s an awkward loner who hasn�t been able to find his place in the world.���� Robert is Xan�s half-brother, and unlike Xan, Robert seems to have his life together. At eighteen, he�s enrolled in community college with a decent job and a great girlfriend. Robert often teases his brother, but he�s also his biggest supporter. No matter what, he�s got Xan�s back.���� When Robert starts to suspect that Xan is traveling down a dangerous path, he may be the only one who can save Xan from self-destructing�before it�s too late. But can Robert save himself?���� This edgy exploration of what goes on in the mind of someone pushed to the brink examines the seeds of extremism that exist in everyone�and is sure to captivate readers of all kinds. When I think of myself in high school, I remember back to being angry with the status quo, angry with politics, etc. I wrote political poetry for our high school poetry slam team, and our coach dubbed me an angry young man, despite my being a woman and all. I think this makes sense, or at least this time in life, because being a teen is a time of rebellion, testing limits, and not liking the status quo if you are being shafted by it. 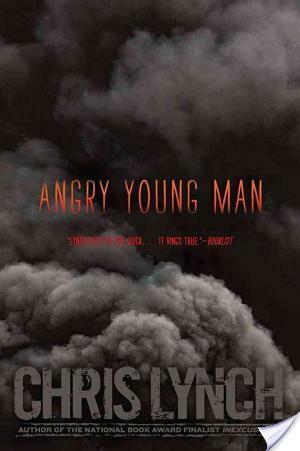 Angry Young Man by Chris Lynch is a very short contemporary young adult novel at 176 pages which explores the dynamic between one such angry young man named Xan who doesn’t seem to fit anywhere and ends up turning to anarchy and his brother, Robert who is Mr. Popular, athletic, and has status. Xan makes some pretty stupid decisions and Robert has to deal with the fallout. I mean, how much can you let someone screw up before you say, ‘ah screw it’ and let them deal with their problems without your intervention? So that is the nutshell plot. As for the characters, I liked Robert, he kind of reminds me of my boyfriend in that he is athletic, plays soccer, hard working, well-liked, and handsome. He takes on responsibilities. Overall, he is a good person. However, I thought Xan’s character brought the novel down. He does some incredibly stupid teenage things. He’s awkward and creepy and weird. I don’t know, I guess as a fairly well adjusted person I was unable to connect with Xan. I thought he was a jerk and felt little sympathy for him. I think Angry Young Man is an okay addition to that which we deem ‘boy books’. It’s short, it has male characters doing male-associated things. There are sports. There are girls. There are cars. There are explosions. Maybe a male would connect better with this novel, due to testosterone.